Styling: Apply desired amount to damp hair, allow to dry naturally or blow dry for maximum volume. Finishing: Apply desired amount to fingers and work through on dry hair. It smells fudge like and is easy to use. It does get sticky so make sure you use a little. 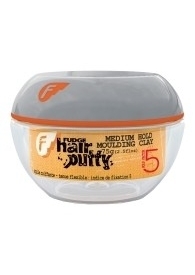 I have used it both st home and in the hair salon and I found it fun and great to work with. The scent is amazing, like fudge/toffee and it does look like fudge too. It looks great on hair without being heavy, but be careful cause if you use a lot, it will make your hair look clumpy.